Have you ever needed to connect to the Internet on your notebook and find yourself in a place with no networks to support? I bet for yes, and it’s just a pretty problem. But you know that if you have an iPhone with an active data subscription on it, you can resolve this kind of emergencies quickly and easily. Do you wonder how? Well, simple: Activating the function called Personal Hotspot. The one of the personal hotspots is a very useful feature introduced by Apple in iOS , which makes it possible to turn the iPhone into a working modem via Wi-Fi, USB or Bluetooth that can be used with any device: not just computers but also tablets, video game consoles, etc. Thanks to it, you can use the 3G / 4G data network to surf the Internet and download files when there are no Wi-Fi connections available. Interesting, right? So let’s not waste any more time and see how to connect iPhone to PC as a modem to take advantage of this possibility. This is an extremely simple and fast operation. If you want to learn how to connect iPhone to PC as a modem, you must first go to your iDevice settings and activate the data network as fast as possible. To do so, press it on the icon of the settings that are on the iOS home screen, moved to Mobile and shifts to ON the lever relative to the option cellular data (if not already active). Next, tap on the Cell Data Options item, go to Item and Data, and enable 4Gnavigation by ticking next to the option. Obviously, if you do not have a data plan that uses the 4G network you can only browse 3G. As well as just as I’ve just told you, if you’re using an iPhone with iOS 11 or later installed, you can also enable the cellular data connection directly and comfortably from the Control Center by calling it through a bottom-up swipe screen and then tap on the button with the antenna symbol that doing so will become colored green. Another important check that you have to make is to make sure that your data plan supports tethering , that is, sharing the data connection with other devices. If that were not the case, the traffic consumed with the transformation of the iPhone into a modem could consume any credit on your card or increase the cost of the bill far. After you have verified the compatibility of your data plan with the tethering function, go to your iPhone home screen, click on the Settings icon (the one with the gear ) and then tap on the Personal Hotspot then move the lever on the Hotspot entry Personal to the right (to make it green). By doing this, the modem mode of the “monafone” will be activated instantly. If you like, you can also change the password to use to connect to the wireless network created by the iPhone. All you have to do is select the Wi-Fi Password in the Personal Hotspot menu and type the security key you want to use for your wireless network. The changes will be applied instantly. If you are using an iPhone with an iOS version of 12 or 11, you can also enable the hotspot function from the counter center. To do this, invoke the latter by swiping from bottom to top, make a long press (and decide if you are using an iPhone that supports 3D Touch) on the Cell Data button then select it from the menu that you is open, the personal hotspot button (the one with the chain ) making it so will become green and is done. 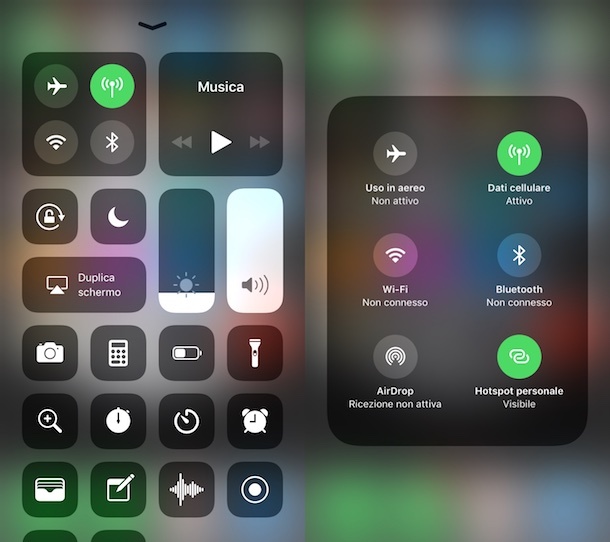 Proper activation of the function will be signaled by the appearance of a blue bar at the top of the screen, where you can also control the total number of devices that you will later connect. At this point, be sure to leave the iPhone in a place where the data network signal is good and turn on the computer (PC or Mac as it is). Then, start looking for new wireless networks and click on [your name]’s iPhone network. Then type the Wi-Fi password set on your phone to establish Internet connection and the game is done: now your computer is connected to the Internet via iPhone, which acts as a modem using your operator’s network! How do you say? Do not you know how to activate the search for new Wi-Fi networks on your computer? Do not worry, this is really a joke! Both on Windows and Mac you just have to click on the network icon next to the system clock (Wi-Fi Cleats) and select your iPhone name from the opening pane. Then you must type the password for network access and the game is done. I also point out that the hotspot function between iPhone and Mac can be completely automatic. Let me explain better: if you are using a Mac product after 2012 with OS X Yosemite or higher as an operating system and an iPhone equipped with iOS 8.1 or later, you do not need to activate the hotspot function manually. If your phone and computer are close to you, the name of the iPhone will automatically appear on the list of available connections on your Mac, which, if selected, will instantly enable your personal hotspot. At the end of navigation, then network sharing will automatically turn off to save battery on the “melaphone”. In all other cases do you want to avoid that your computer automatically connects to the iPhone’s hot spot when it is running? So before you connect to the mobile phone network for the first time, remember to remove the check mark from the password storage entry and it is done. Have you already allowed your computer to store the password of the hot spot? You can easily mend it by following the directions below. If you are using a Windows PC , click on the network icon next to the system clock and select the Open Network and Sharing Center entry from the menu that appears (on Windows 8.x / 10 you have to right- network icon and no left click). In the window that opens, click on the Manage Wireless Networks located in the left sidebar, choose the iPhone connection and click the Remove button . If you have a Mac , open the application Keychain Access (located in the folder More of the Launchpad ), select the entries System and Passwordon the left sidebar, right-click on the name of the network created from your iPhone and click on the entry Delete from menu that appears. If your computer does not have Wi-Fi support, you can connect iPhone to the PC as a modem via a USB socket (using the supplied Lightning / Dock cable, what you use for syncing with iTunes) or via the Bluetooth network, your PC has support for this technology. Once you’ve finished browsing, to turn off hotspot mode on your iPhone, go back to the Settings> Personal Hotspot of iOS (you can quickly access it by taping the blue color bar located at the top of the screen) and move it again to the left the hotspot for the Personal Hotspot option . Alternatively, you can turn off the function by going to Settings> Mobile> Personal Hotspot and turning OFF the corresponding lever or, by calling the control center, holding a long press on the cell data symbol and unchecking the hot spot icon doing so will become gray). Easier than that?